After last year’s wonderful releases, the Honor 6 and 6 Plus, Huawei is back this year with another flagship - the Honor 7. This time around, Huawei has loaded the phone with many features found on flagship smartphones, apart from featuring some of its unique ones. For example, the phone features a fingerprint scanner on the rear and also a special Smart Key which can be customised to trigger certain commands when pressed. 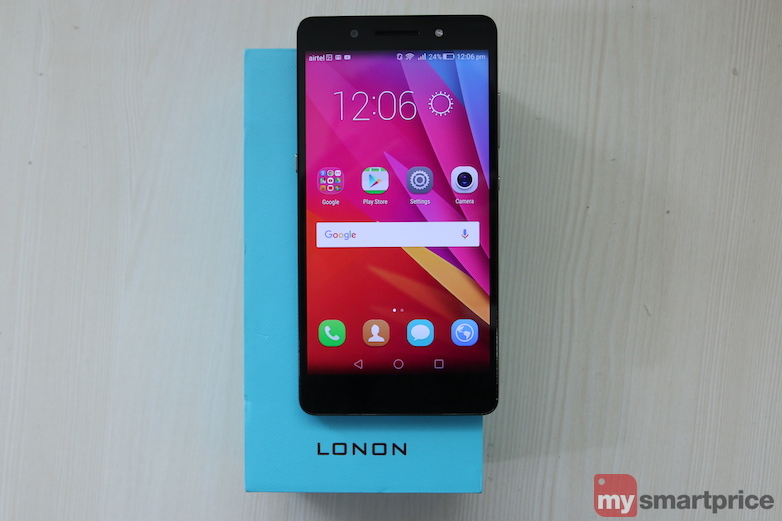 Furthermore, the phone also has a couple of upgraded specifications, with the most important one being the 20-megapixel rear camera that comes with fun modes like Light Painting and Good Food. All in all, the Honor 7 shows enough potential to be the mid-range smartphone that takes the top spot this year. But do note that this device faces intense competition from the likes of the OnePlus 2, Motorola Moto X Play and the Meizu MX5 in this price range. 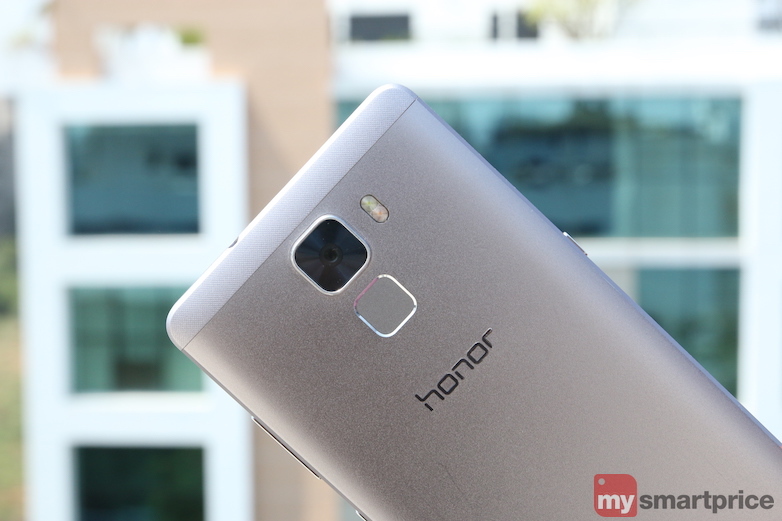 Let’s find out how it performs and if you should consider buying the Honor 7 over others. 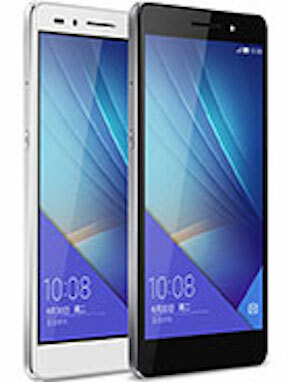 The Honor 7 incorporates a 5.2-inch display in a candy bar body (fairly compact by today’s standards) with dimensions of 143.2x71.9x8.5mm. The 8.5mm thickness of the phone combined with an all metal unibody makes the Honor 7 a fairly sturdy phone. Of course, its weight of 157g is on the higher side, but we felt that this heft only made it more reassuring to hold. Additionally, the ceramic blasted finish on the metal body ensures that the phone doesn’t slip from your hands. Undoubtably, the Honor 7 is one of the most comfortable to use phones that we’ve come across in the recent past. On the front face of the phone, Huawei has decided to use on-screen buttons for navigating the UI. These on-screen buttons can be customised from the Settings menu, as per the user’s choice. Above the display on the front, the Honor 7 has an earpiece in the centre and flanked on either side of it are the front camera and soft LED flash. Oddly, the LED light for notifications is built inside the earpiece. 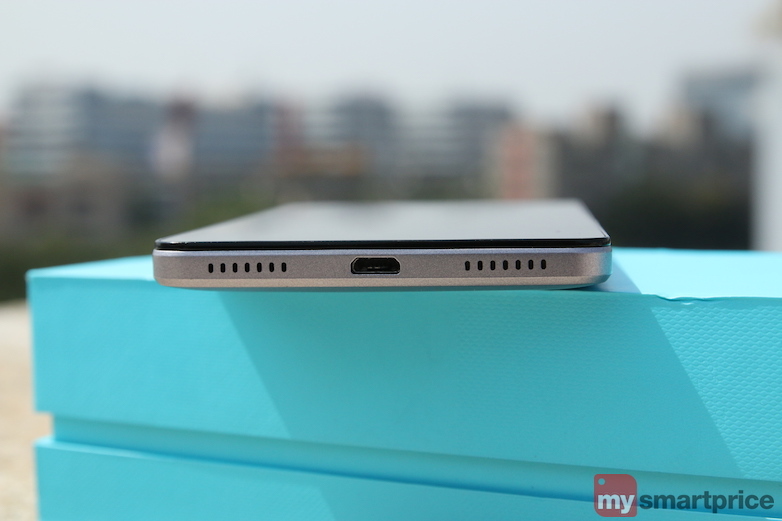 The bottom edge of the phone has the Micro-USB charging port and on either side of it are two machine-drilled speaker grilles. Do note that only the left speaker grille works as the loudspeaker, and the right one is there just to maintain a balance in terms of design. 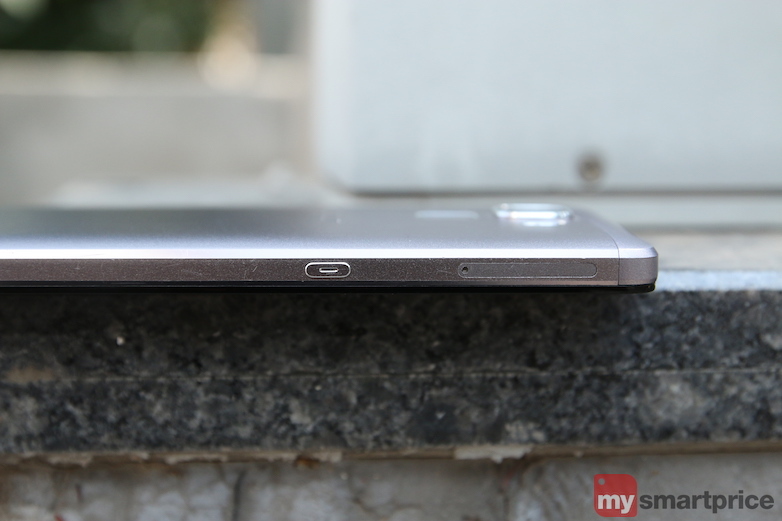 The 3.5mm audio port, microphone, and Infrared port are all present on the top portion of the phone. The right edge of the Honor 7 has the power button and the volume rocker. The power button has a distinctive texture and is also slightly recessed, which makes it easy to distinguish it from the volume rocker. Both, the power button and the volume rocker, have good tactile feedback. The SIM card tray lies on the left edge and so does the special Smart Key that we talked about earlier. We will discuss the functionality of the Smart Key in the Software section. The rear side of the Honor 7 houses the camera with dual-LED flash, and the fingerprint scanner sits right underneath it. The camera module is housed on a slight bump, and so the phone wobbles a bit when placed on a flat surface. The placement of the fingerprint scanner is really convenient, and we were also really surprised at its ease-of-use. However, do note that if (and when) the Honor 7 is placed on a flat surface you will have to resort to using the screen to unlock the phone. The 5.2-inch IPS-NEO LCD screen has a display resolution of 1080x1920p. This translates into a pixel density of approximately 424 PPI, which makes it a really sharp screen. Furthermore, the phone has a pretty high screen-to-body ratio of 72.4 percent. What this essentially means is that the bezels at the side of the phone are pretty narrow, and the front is almost entirely covered by the display. The Full-HD display is really crisp and even the colours on it are fairly neutral. The blacks are adequately deep on the screen. The screen can also get really bright and auto-brightness works like a charm. Legibility under bright sunlight is very good since the screen can get quite bright. The viewing angles on this display are pretty good too. Surprisingly, Huawei doesn’t mention if the display has any sort of protective glass, like Corning’s Gorilla Glass, on top of it. Therefore, we can’t really tell if the display can withstand any scratches or not. Internally, the phone uses a homegrown HiSilicon Kirin 935 CPU octa-core SoC. This SoC includes four A53 cores clocked at 2.2GHz and four more A53 cores closed at 1.5GHz. The Kirin 935 SoC also includes a Mali-T628 MP4 GPU. The Honor 7 packs 3GB of RAM, which is more than sufficient for running multiple apps without any hiccups, and it also has 16GB of internal storage space. This internal storage space can be further expanded by up to 128GB using a microSD card. The Honor 7 has a 20-megapixel rear camera with dual-LED flash and an 8-megapixel front-facing shooter with a single-LED soft flash. Despite the fact that Huawei provides a tray with two SIM card slots in it, only one is active. The Honor 7 supports Indian LTE bands and we were able to connect to Airtel’s LTE network in Hyderabad without any hassles. Other connectivity options include Wi-Fi a/b/g/n, Bluetooth v4.1, and Infrared. The Honor 7 has sensors such as an accelerometer, a gyroscope, a proximity sensor, and a compass. A 3,100mAh battery present inside the phone provides the juice for the phone to function. 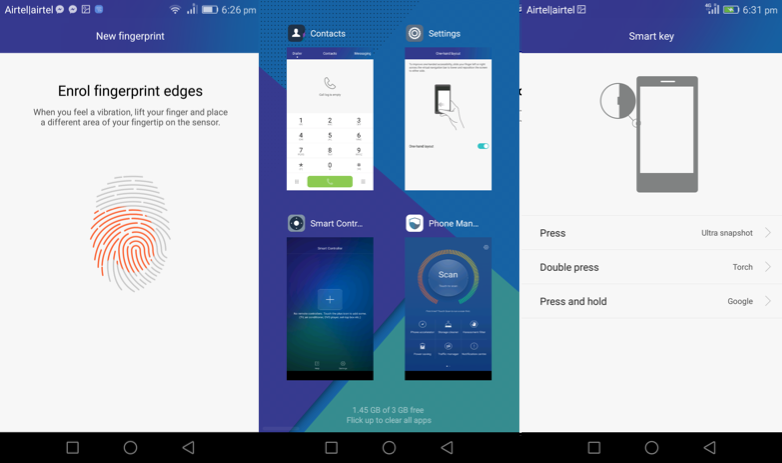 The Honor 7 has the latest version of Huawei’s Emotion UI 3.1 skin running atop Android 5.0.2 Lollipop. The EMUI 3.1 skin does not have an app drawer and all the apps are lined up on the home screen itself. This means that you will have to resort to creating folders so that the home screens are not flooded with individual apps. EMUI 3.1 is visually attractive no doubt, but there are no signs of Android’s material design anywhere. The built-in themes are a little too childish, in our opinion. EMUI has a ton of embellishments, but let’s start with how the Smart Key works. The Smart Key can be pressed, double pressed or long pressed for specific functions. Each of these commands can be assigned a predefined shortcut like ultra snapshot, voice recording, torch, and screenshot. While the rest are self-explanatory, Ultra snapshot can be used to capture an image in an instant when the phone is in sleep mode. In fact, this feature also displays the time it takes to capture the image. These three levels of the Smart Key can also be configured to open apps directly. Towards the end, we got so used to using the Smart Key, that we feel it should be implemented by more manufacturers. You can configure the fingerprint scanner to recognize up to five fingerprints. 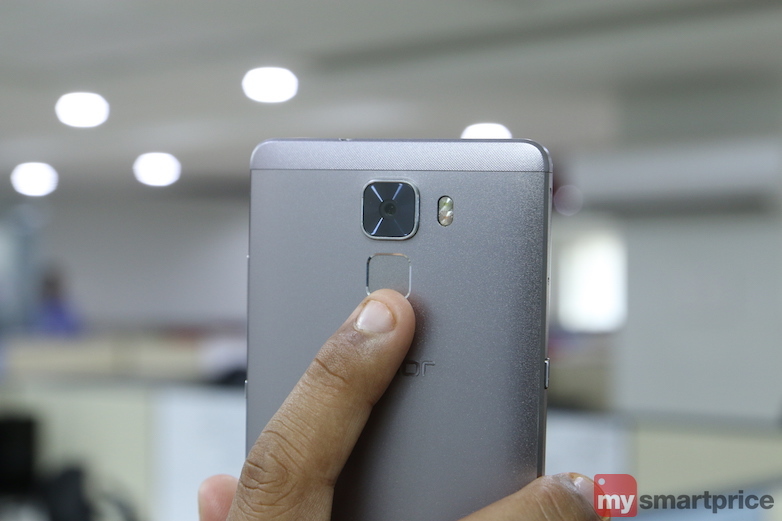 This fingerprint scanner is one of the best we’ve used till date. It is lightning fast and worked for us every single time without fail. What’s even better is that the fingerprint scanner responds to various gestures such as touch the sensor to back one step, touch and hold to return to the home screen, slide down to open notification panel and slide up to see recent apps. These gestures work with any finger and you don’t necessarily need to use the same finger that you had used during the registration. Also take note of the fact that you can activate or deactivate as per convenience. While these gestures are useful, it is likely that you may accidentally hit the fingerprint scanner because it is at such a convenient position. Huawei also offers a voice command feature. However, unlike Apple’s Siri or Microsoft’s Cortana, it responds to fewer commands. All of Google’s apps come pre-installed on the phone, with quite a few third-party ones as well. Third party apps include Clean Master, AppsGallery, InMobi Services, UC Browser, WhatsApp, and Facebook. Thankfully, all the third party apps can be uninstalled. Our favourite app on the phone is the Smart Controller which uses the Infrared Port to control devices such as televisions, air conditioners, DVD players, and set-top boxes. It worked flawlessly with all of our devices. Huawei has been tooting its horns about how great the rear camera on the Honor 7 is, and we are happy to report that it is totally worth the hype. The 20-megapixel rear shooter, along with the Sony IMX230 sensor can capture some incredibly detailed photographs with natural colours. Images captured in daylight are crisp and exposure is under control as well. If the sun is too harsh, you can resort to using the HDR mode to capture images that have a lot of details in them. We noticed that using the HDR mode made a whole lot of difference to the images captured under direct sunlight, as it did a good job of keeping over-exposed areas under check. The camera can handle highlights and shadows admirably. The camera also allows you to get really close to the subject in case you want to shoot macro photos. The only gripe we had with the camera was that it was considerably slower than some of the other phone cameras that we’ve used. The camera app by itself provides a lot of options to shoot images with. This app resembles iOS’ default camera app. The app has two interesting modes, namely Good Food and Light Painting. In light painting, the camera opens up the shutter for the user as he/she draws using the light source available. 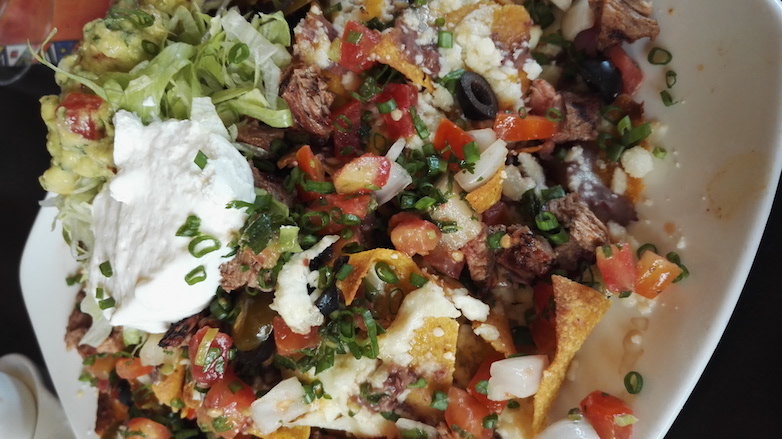 Good Food only increases the saturation in the images, thereby making colours pop. 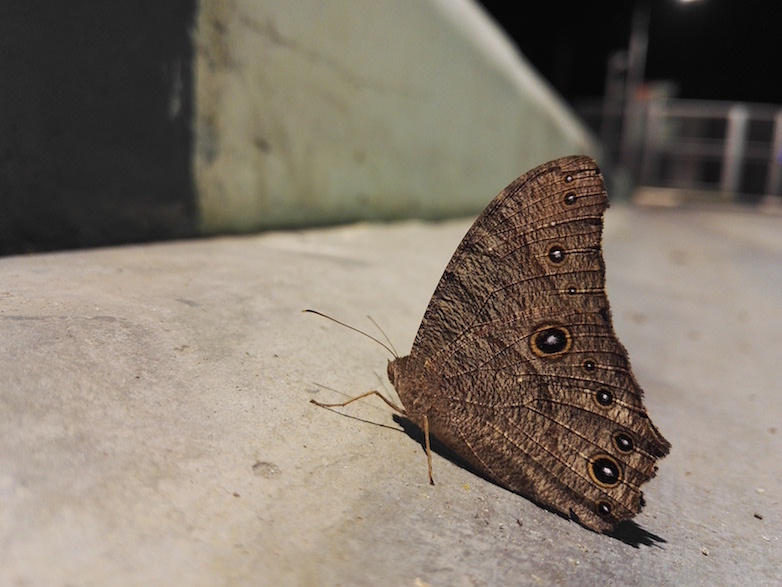 If you can keep the phone stable on a tripod or on a flat surface, the Honor 7 can capture some incredibly detailed shots, using the Super night setting on the phone. 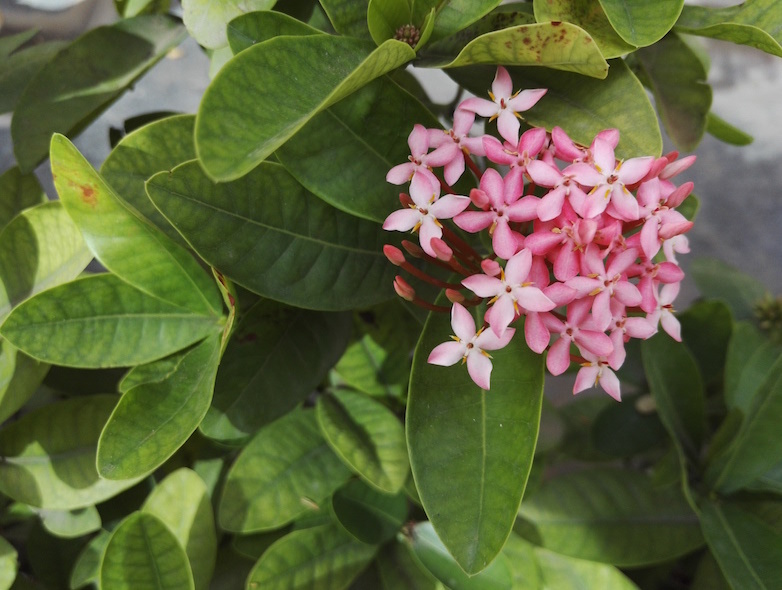 The All-focus setting can be used to capture a single photo with multiple areas in focus. It works really well. The 8-megapixel front camera can also shoot some decent selfies. While shooting at night, the LED light on the front remains switched on and doesn’t work like a regular flash. It casts a soft light on the face to light it up evenly and we quite liked this implementation. There is also a special Beauty mode which clears blemishes on the face. The only achilles heel of this camera is its video recording capabilities. Our 1080p sample video had overexposed areas around the edges and we also noticed some stutter. Even the slow-motion video stuttered a little too much. The Honor 7 comes with a fairly basic player for music and video files. Interestingly, the icons for both these apps resemble the default apps (for the same files) on iOS. The music player has a very basic design and a special toggle for DTS sound. While using our reference headphones, we found this DTS setting to be slightly annoying, especially at high volume levels. Do note that Huawei doesn’t bundle headphones in the box. When listening to music using our headphones, the sound was slightly above average and we felt that it could have been better. The single speaker does not get too loud and the sound quality through it was not too great either. It crackled at higher volumes. The phone managed to play even our highly encoded 40Mbps 1080p file on the default video player, but you might want to download a third-party app for playing 4K content. The Honor 7 works smoothly while performing regular tasks such as opening apps, browsing the web and playing music. We didn’t face any lags during the time we spent on this device. Huawei has managed to optimise the UI with the hardware superbly, to provide a seamless experience. That said, gaming on the phone is a subpar experience. The Mali-T628 MP4 GPU is not suited for graphics intensive games like Asphalt 8 or Dead Trigger, but casual games like Temple Run work fine. Putting the device through graphics benchmark tests such as 3DMark Ice Storm Unlimited and GFXBench returned mediocre scores of 10,057 and 12fps respectively. That said, the AnTuTu score of 50,755 is indication that the Kirin 935 SoC is more than capable of performing regular tasks. The most important trait of the Honor 7 is that it doesn’t heat up even during intensive tasks. The earpiece quality is exceptional, almost as good as on Motorola phones. We could hear the caller without any distortion whatsoever. The caller at the opposite end too, could hear our voice clearly. We did not face any call drops either. We pushed the 3,100mAh battery inside to its limits with our power usage. Our review unit was constantly connected to 4G. Furthermore, we made two hours’ worth of calls, played Asphalt 8 for around half an hour, used messaging apps such as WhatsApp, Telegram, and Facebook Messenger extensively, and also streamed music on Gaana and Saavn intermittently. The phone’s battery lasted us for around 12 hours during this period, which is pretty good. We expect it to last a good day and half on moderate usage. In case you want to increase the battery life, Huawei provides power saving options such as Performance, Smart, and Ultra. The Performance mode uses all the cores to get optimum performance from the phone, whereas the Smart mode uses all the cores only when necessary and tries to save on the battery life. The Ultra mode keeps only basic functions like call and message active. Huawei’s latest flagship, the Honor 7 is an impressive device. It is better than its predecessors in more ways than one. We loved the design, the rear camera’s performance in low light, and its generally spiffy performance. However, the Honor 7 is not suited to anyone looking for a gaming device, which is the phone’s biggest flaw. 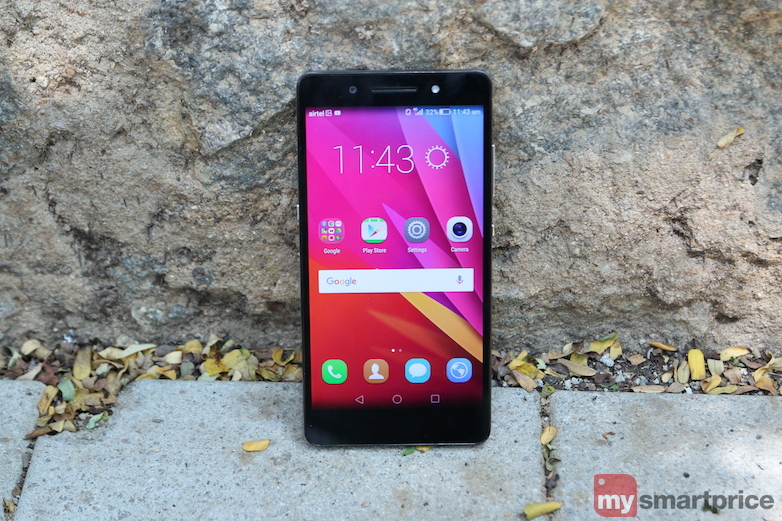 The Honor 7 goes up against phones like the OnePlus 2, Meizu MX5, and the Motorola Moto X Play. 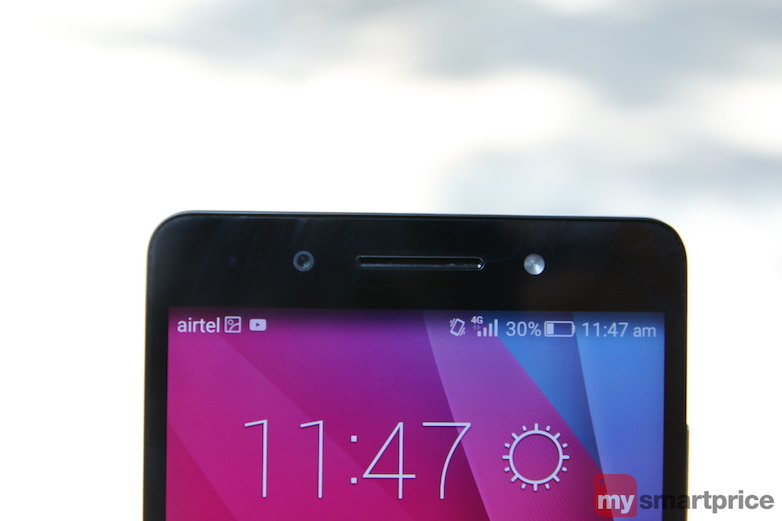 We are going out on a limb and saying this: the Honor 7 is our favourite mid-range flagship at the moment. Having said that, the OnePlus 2, Meizu MX5 and the Motorola Moto X Play have advantages of their own. Read our review of each device to find out what's different.